Projekt proudly announces the debut album from former Dead Can Dance drummer / percussionist Peter Ulrich. Pathways and Dawns takes you on an expedition full of tribal drumming and chants, roaring horns, drifting marimba and flutes, African and flamenco guitars, bellowing Javanese gamelan, jamming Jajoukan pipes, Algerian Rai-inspired percussion, droning hurdy-gurdy and Ulrich’s own distinctly understated vocals. With superb, crystalline production and musical assistance by DCD’s Brendan Perry, Pathways and Dawns is varied and original, hauntingly melancholic, yet powerfully uplifting. 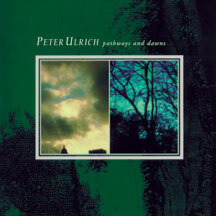 Pathways and Dawns is an excellent debut… a rich, well-made masterwork. His first album is a remarkable piece moving on the edge between ethnic and medieval art pop music. Pathways and Dawns is a wonderful collection of songs that, while in the 4AD school, shimmers with an inner lightness that makes it very different from any other 4AD album. Calming vocals, atmospheric backgrounds and tribal percussions make up a good chunk of this wonderful debut… The recording is top notch and it’s obvious that Ulrich put his heart into it. Do yourself a favor and check this out. Ulrich makes his own way… from the majestic epic of the ten year old soldier Taqaharu to the joyous celebration of the source of inspiration on The Springs of Hope… dreamy lyrics a la Syd Barrett… This is a fine album by an artist I’d love to hear more from soon. It’s beautiful… it’s also very interesting in its choice of world-sound crossovers and skillful lyrics… emotionally poignant, poetic and in its own way, experimental. Ulrich successfully incorporates graceful folk music, powerful tribal beats and soothing synths into one enchanting full length effort.